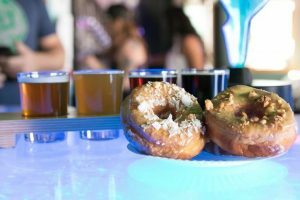 Celebrate the 3rd Anniversary of Kilowatt Brewing and our Kearny Mesa Tasting Room with a special beer pairing with Nomad Donuts on Saturday, March 24th from 12:30 p.m. to 2:30 p.m.
Executive Pastry Chef, Kristianna Zabala, never holds back in her creative and inspiring pairings, baking and pairing each donut with one of our unique, small batch beers, including some of our special Anniversary releases. 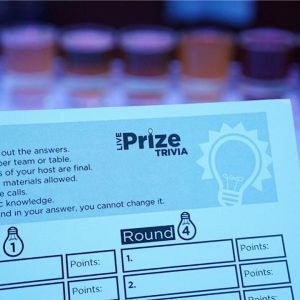 Tickets are $18 and get you a 4 x 4 pairing (four donuts and four 4 oz tasters). Event space is limited, so get your tickets soon. Design and paint your own 20 ounce high quality glass mug. Class includes painting demonstration, 2 hour instruction on glass painting techniques, and painting supplies. $25 - Painting Class: Includes painting instruction, painting supplies, a full pour to enjoy while you paint, and of course your finished 20 ounce mug. $15 - Extra Mug: Want to paint 2 mugs? Add an extra mug to paint & take home. 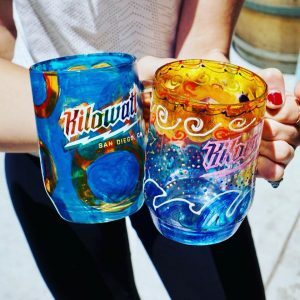 $45 - Mug Club Combo: Includes painting instruction, painting supplies, a full pour to enjoy while you paint, your finished mug, & a 1 Year Membership to Kilowatt's Mug Club. You have the option to keep your painted mug displayed at Kilowatt to enjoy anytime you visit. 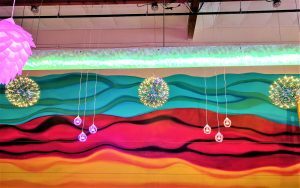 Join Kilowatt Brewing on Thursday, April 19th at our Ocean Beach Tasting Room for a special one-of-a-kind exhibit of the cosmic blacklight paintings of the Spaceman of Ocean Beach. Clint Cary, aka The Spaceman of Ocean Beach, returns for a 30 year retrospective of his blacklight cosmic art featuring images from the Planet Rillispore. The Spaceman, as he was known by the locals, claimed to have been contacted by beings called Rillisporians and taken to their planet in 1957 and again in 1958. The experience changed his life and his art. The Spaceman dedicated the rest of his life to painting fluorescent images of the planet and retelling his stories of traveling to another world. For the lucky ones that new the Spaceman, and had the right “vibration” he would give a space number guaranteeing a spot on the Rillisporian spaceship when they returned to save mankind from its self-destructive ways. The Spaceman is considered one of Ocean Beaches most celebrated and notorious characters. April 15, 2018, marks the fifty-fifth anniversary of the Spaceman’s arrival to OB. Clint Cary (1909-1993) From Alta Dena, CA. Moved to Ocean Beach April 15, 1963. 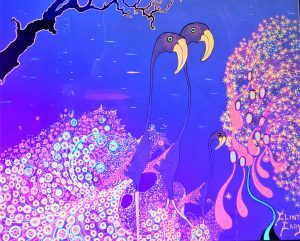 Don't miss this unique opportunity to experience the original blacklight paintings of Clint Cary and a look at Planet Rillispore.